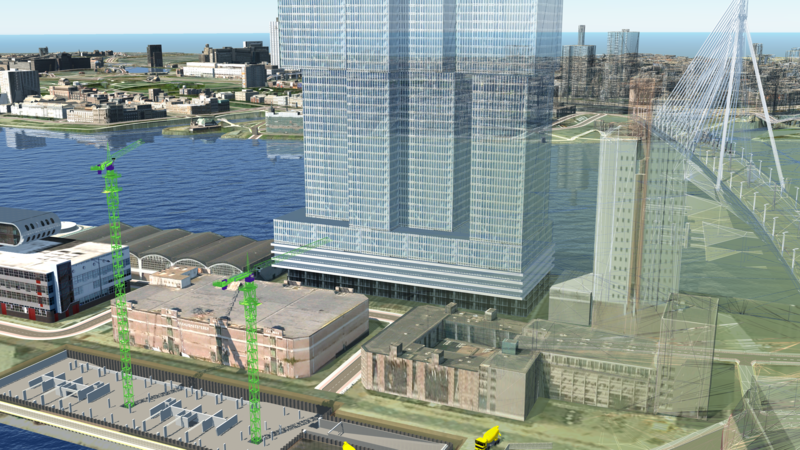 InfraWorks 360 visualization of a new double tower project to be build in Rotterdam, The Netherlands. Challenge was to create a typical 4D simulation which in the current software is limited. Background models are connected through CityGML (http://www.rotterdam.nl/rotterdam_3d). Foreground models are coming from 3D Warehouse (https://3dwarehouse.sketchup.com/). BIM model of towers comes from Autodesk Revit. All models are georeferenced. Started out using Model Builder. Is this created from a series of videos with the same camera path and then using a simple fade to cut from one to another?